with 2,900mg's of Fish Oil (EPA 1050mg DHA 708mg DPA 135mg) Highest amount available! FOR CHEAP OR LOW AMOUNTS OF EPA-DHA-DPA IN THEIR PRODUCT! COMPARE OUR OMEGA3 TO THEIRS! LOOK TO SEE HOW MUCH EPA AND DHA AND DPA IS IN THEIR PRODUCT! The benefits of taking Omega3 fish oil are well documented. There are 2 main beneficial components to fish oil that you need to know about ( eicosapentaenoic acid (EPA), and docosahexaenoic acid (DHA). When purchasing Omega 3 Fish Oil you should be looking for the highest amount of milligrams (mg) of EPA and DHA. DPA is an Omega-3 fatty acid similar to EPA, but the body can store twice the amount of DPA in blood as EPA. Recent scientific studies have focused specifically on DPA due to the increasing recognition that DPA has powerful therapeutic potential to work synergistically with EPA and DHA creating enhanced results. Chiropractor's Blend Omega-3 has one of the highest concentrations on the market. OUR OMEGA3’S ARE ENTERIC COATED SO THERE IS NO FISHY AFTERTASTE OR BURPING A FISHY TASTE. Ultra Pure Omega3 2900 EPA-DHA-DPA™ is cutting edge Essential Fatty Acids (EFAs). Because our bodies do not manufacture EFAs on their own, Ultra Pure Omega3 2900 EPA-DHA-DPA™ provides these "necessary for life" fatty acids that have been shown to be deficient in the "standard American diet." EFAs have been shown to have a profound effect on the production of prostaglandins. EFAs support healthy blood circulation, normal blood pressure, may reduce inflammation and help balance bodily fluids. EFAs promote optimal cardiovascular, skin, nervous system and immune health. They are necessary for maintai ning bone health, regulating your metabolism and to maintain reproductive capabilities. Omega-3’s EPA (Eicosapentanoic Acid) and DHA (Docosahexanoic Acid) are the main components of the brain’s neurons and all cell membranes. Ultra Pure Omega3 2900 EPA-DHA-DPA™ utilizes the PureMax® system, which uses a proprietary engineering technology to concentrate and purify lipids to exacting standards over a minimum of three molecular distillation steps. 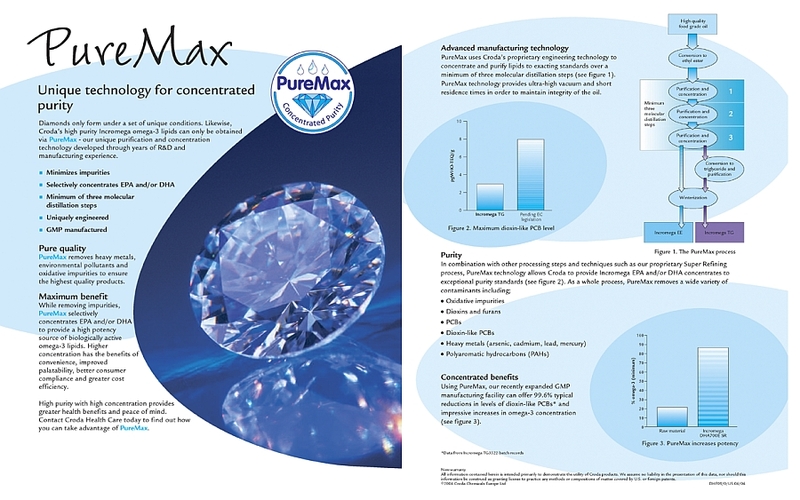 PureMax® offers a 99.6% typical reductions in levels of dioxin-like PCBs and impressive increases in omega-3 concentration. Chiropractor's Blend Ultra Pure Omega3 2900 EPA-DHA-DPA™ is cutting edge Essential Fatty Acids (EFAs). Because our bodies do not manufacture EFAs on their own, Ultra Pure Omega3 2900 EPA-DHA-DPA™ provides these "necessary for life" fatty acids that have been shown to be deficient in the "standard American diet." EFAs have been shown to have a profound effect on the production of prostaglandins. EFAs support healthy blood circulation, normal blood pressure, may reduce inflammation and help balance bodily fluids. EFAs promote optimal cardiovascular, skin, nervous system and immune health. They are necessary for maintaining bone health, regulating your metabolism and to maintain reproductive capabilities. Omega-3’s EPA (Eicosapentanoic Acid) and DHA (Docosahexanoic Acid) are the main components of the brain’s neurons and all cell membranes. Ultra Pure Omega3 2900 EPA-DHA-DPA™ utilizes the PureMax® system, which uses a proprietary engineering technology to concentrate and purify lipids to exacting standards over a minimum of three molecular distillation steps. PureMax® offers a 99.6% typical reductions in levels of dioxin-like PCBs and impressive increases in omega-3 concentration. Omega-3 Fatty Acids In Their Diet! A clinical trial has been published from Italy which has evaluated the effect of omega-3 supplementation on cognitive performance in normal healthy adults with mean ages of 33 years. This study indicated that supplementation with 800 mg of DHA plus 1600 mg of EPA for a 35 day period was associated with an improvement in the profile of mood state as measured by the POMS (Profile of Mood Stage) analysis. The POMS analysis showed an increase of vigor and a decrease of the other mood states (anger, anxiety, fatigue, depression, confusion). This published trial raised the possibility that normal healthy subjects in good health (and performing physical activity) may possibly obtain some further improvement in cognitive functioning via activity of the central nervous system in the presence of an already good condition of well-being. It is noteworthy that the level of DHA plus EPA (combined) intake in this study of 2400 mg/day is approximately 3-fold the aforementioned recommended intake from the NIH Workshop and 16-fold the current North American intakes. Despite regular recommendations from various governmental and other health agencies for the public to increase their intakes of fish as a source of DHA + EPA, North Americans consume approximately only one fish serving every 7-10 days. Is Crucial For Heart Health And Anti-Inflammatory Response. Our Cardiovascular Health is often cited as the number one concern for people in the Western world. Marine-based Omega-3 fatty acids have been shown through years of clinical research to be important for cardiovascular health. Supplementation of EPA and DHA fatty acids has demonstrated a positive effect on blood lipids, especially triglyceride levels, and can help keep normal cholesterol levels in balance. The American Heart Association recommends daily intake of Omega-3 fatty acids for their proven cardio-protective benefits. But our bodies also require a Healthy Inflammation Response. Acute inflammation is the body s normal protective response to injury and is generally a short-term condition. However, when cells in the body experience ongoing, low-grade or chronic inflammation, it is harmful. This chronic condition is often called hidden inflammation because it can go undetected for years, and research shows that it is responsible for many of the age-related diseases that plague our modern society. A typical Western diet that is too high in Omega-6 fatty acids compared to Omega-3 fatty acids, can create a condition within the body that contributes to low-grade or chronic inflammation. Clinical research shows that marine-based Omega-3 fatty acids, especially EPA, has strong anti-inflammatory effect in the body. Millions of people, and especially those with aging joints, are looking for products that can help them keep moving in order to enjoy a good quality of life. Marine Omega-3 fatty acids have been shown to provide nutritional support to help keep the cartilage between the joints healthy. More specifically, it is the fatty acid EPA that has been clinically proven to help maintain day-to-day mobility. EPA supplementation was found especially beneficial for those people with morning joint stiffness. Containing cutting edge Essential Fatty Acids (EFAs). Because our bodies do not manufacture EFAs on their own, Ultra Pure Omega3 2900 EPA-DHA-DPA™ provides these "necessary for life" fatty acids that have been shown to be deficient in the "standard American diet.". Omega-3’s EPA (Eicosapentanoic Acid) and DHA (Docosahexanoic Acid) are the main components of the brain’s neurons and all cell membranes. Ultra Pure Omega3 2900 EPA-DHA-DPA™ utilizes the PureMax® system, creates impressive increases in omega-3 concentration.